It has to be said that the holiday is taking its toll. Yes, we’re really enjoying ourselves, but living out of a suitcase in a strange place can lose its charm under certain circumstances. We’re not there yet but we are feeling the effects of tiredness now and then. We’re sort of split between wanting to maximise our enjoyment while we’re here (this could very well be the last time we ever get to do something like this) and just chilling out. There’s plenty to be said for either approach. Getting the balance right isn’t an exact science. We left the house at around 10am this morning. Choosing instead for a quick breakfast, we stopped in at a nearby MacDonald’s for a bite to eat. I had low hopes for this, but I have to say I was pleasantly surprised. They do sell a half-decent breakfast. Everyone filled up and were energised for the day ahead. Our plan again today was to meet up with Kirsty, Andy and the girls at the Blizzard Beach water park. Joey seemed keen on the idea when we first floated it, which meant our battle was already half won for the day. For their part, the Bissets were doing the Chef Mickey breakfast this morning for the girls. I’ve no doubt they would have really enjoyed that experience. I do get a sense that they, too, are ever so slightly waning from the effects of excessive holiday happiness from the past few weeks here in Florida. Sandy and I see so much of ourselves in Andy and Kirsty and their kids. I suspect this is part of the reason we like them so much. Much of what they are experiencing in life at the moment mirrors in many ways where we have already been in our lives. Like myself, Andy does find himself in the doghouse every now and then. We just accept it as our lot in life. I think Andy and I have become something of kennel pals. 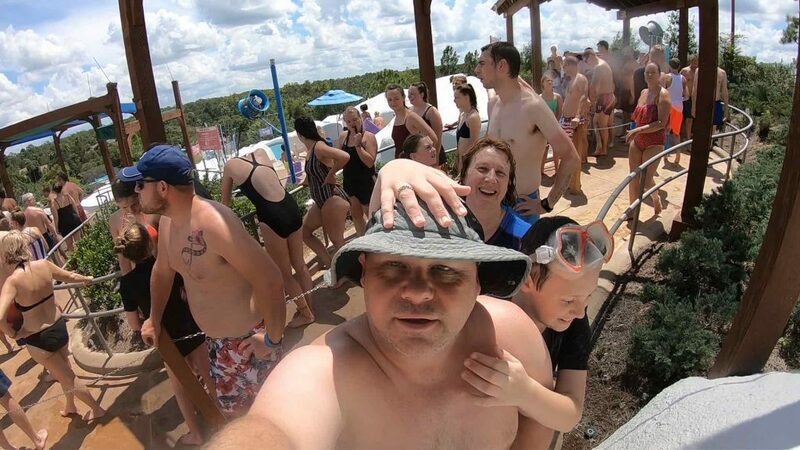 We met up with the Bissets at Blizzard Beach as planned. First up was an immediate dip into the lazy river. Everyone enjoyed drifting effortlessly around the river on inflatable tubes. Like the last time we were here, it was pretty much the highlight of the day from a relaxation point of view. 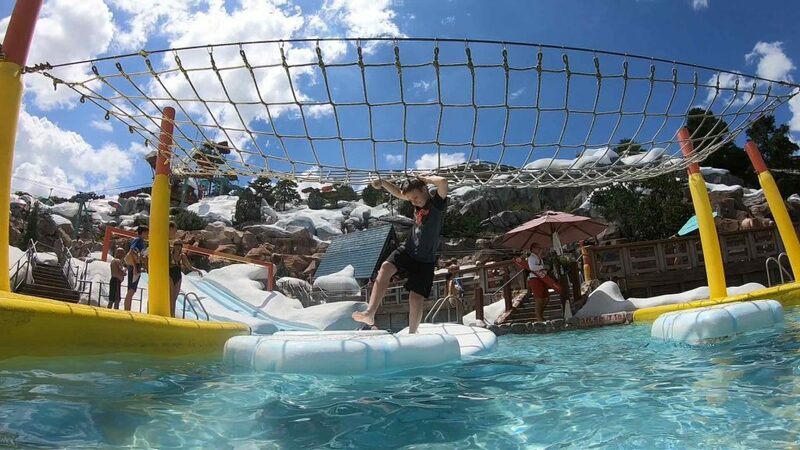 After our circuit of laziness, Joey made a beeline for the iceberg assault course again. He’s really comfortable in this kids’ area of the park, so we were happy to hang out there. It’s also where we had parked all our stuff anyway. The fun there lasted a good while. 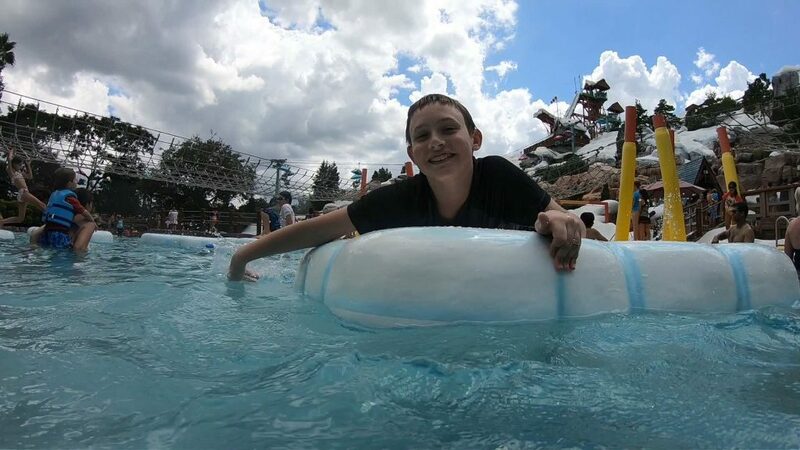 Eventually, however, we decided to take in some of the slide and flume rides we didn’t do the other day. First up were the toboggan racers. This is where eight people race each other side-by-side on mats. Joey was hesitant initially, but he did eventually go down. I got some great GoPro footage of that one. Although Joey enjoyed the toboggan racers, he actually wanted to do the slalom racers more. His reasoning was that it wasn’t quite so high up. I did try to explain that the slalom racers finished lower down and thus the total height drop was the same as the toboggan racers, but he wasn’t having it. Either way, he wanted to go back up and do the slalom racers, so I went up with him. Sandy decided she’d stay down below and try to get some GoPro footage of us emerging into the pool at the bottom of the run. What none of us had considered was the fact there was no way to know from the bottom just when we were going to emerge. Sandy, bless her, did no fewer than nine attempts at filming us emerging. She caught us on the ninth run but not until after we had actually emerged. Back over at the assault course, the kids and adults alike continued to enjoy themselves. The cast member life guards did have to call out to some of the kids (ours included) a few times for a bit of rough play and for trying to get too many people at one time on to the floating icebergs. Andy and I also did rather well with the impromptu Disney trivia game a couple of the cast members had organised with a loud speaker. To be fair, very few others were joining in – and certainly nobody else was volunteering answers anywhere nearly as loudly as Andy or I either. Something we’d not seen (or perhaps just not paid much attention to) the last time we were here was a flying fox (zipline) for kids under a certain height. It was in the adjacent pool to the one we were all playing around in. I suggested Joey have a crack, which he did. He went into the queue and I stood there for quite a while poised to film his run, but he didn’t emerge. I caught Andy’s eye and asked him to check in on Joey. He was probably letting the other kids all push ahead of him – he doesn’t do queuing very well. Andy rectified this, and Joey came sliding down the zipline shortly thereafter. Courtney was hot on his heels. While I was waiting for Joey to emerge, there was a bit of drama. Sitting on a chair at the end of the zipline pool was a lifeguard cast member. He was supervising the kids and the pool area and also pressing buttons to retract the zipline each time he was happy for the next child to go down. A particular child went down the line and plunged into the pool. She must have been about six or seven I would guess. She wore one of the park life vests but must have appeared to the life guard to be struggling. Quick as a flash, the guard blew his whistle and launched himself into the pool and over towards where the child was doggy-paddling towards the stairs at the side of the pool. Bear in mind the guard was clothed in a park uniform at the time. I was really quite impressed with his reaction and unrestrained call to duty – even if it wasn’t actually necessary in the end. The guard saw the child safely to the edge, swam back and climbed back out and onto his podium again. Another life guard had reacted to the whistle and stood watch while all this was playing out. From my vantage point, it seemed that the park’s procedures were doing exactly what they were supposed to be doing and working really very well. Then, once the now soaking wet life guard was back on his podium, a British man walked up to him and started yelling at him. We’re not sure what the deal was. Eventually, a couple of other cast members – one of which looked like a supervisor – came over and chatted briefly with the irate man, who eventually calmed down and wandered off. This freed up the wet life guard to continue his supervision of the kids in the pool. I felt really quite sorry for the guard to have been subjected to a fit of rage from the Brit. With the drama of the zipline spat over, we all went off to find some snacks. Sandy had wanted to get out of the pool and head home, but I felt I could squeeze one snack in before we left. Alas, this delayed us long enough to be caught in today’s afternoon thunderstorm and downpour. It wasn’t nearly as intense as the one from the other day here at the park but enough to shut down all the water attractions and to send everyone scurrying for shelter. About a half hour later, the rain had eased up, although the skies didn’t clear. We all went our separate ways and made it back to our cars. None of us changed, although we did wrap towels around us for in the car. We made our way over to a nearby Super Target store, where Joey and I went to pick up a Power Ranger sword Joey had been eyeing. For the past couple of weeks, Joey has been watching endless Power Ranger episodes on Netflix. It has become a part of his routine and the bubble he has created around him. In fact, it’s driving me absolutely bloody mental. While in Target, I took the opportunity to pop into the restrooms and get changed into my dry clothes I had prepared before leaving the house this morning. Along with his sword, I also picked up a small LEGO set for him. In truth, this was something of a bribe to prepare him for the remainder of the day. It worked. In the meantime, Sandy and Jennifer were having the time of their lives next door at the Dollar Tree store. I expected them to emerge by their own volition but that never happened. I had to go in and rescue them myself. 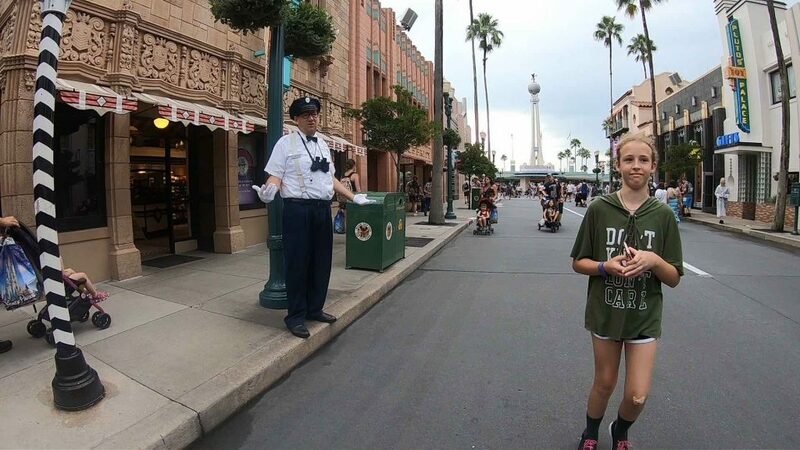 With a character dining reservation over at Hollywood Studios – the last one we plan to do – we drove over there and made our way in to the Hollywood and Vine restaurant. 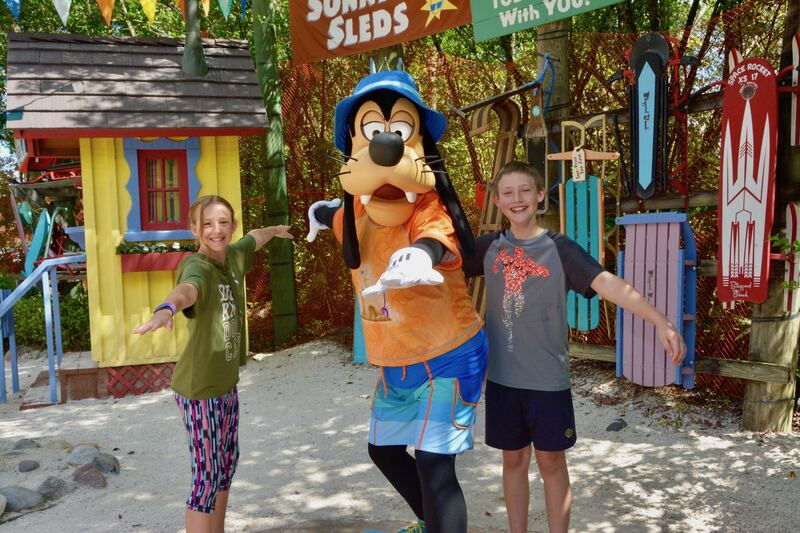 The original plan was to do a couple of attractions first, then have dinner before heading over to the Fantasmic amphitheatre for the end of the day show. Joey was whining about being hungry. Rather than push that boulder uphill for the next couple of hours, we decided to chance our luck at getting seated early. The young lady at the podium outside the restaurant did say that we were quite early, but she called through to someone to see what could be arranged. I told her my son was autistic and that we might need to leave the park early because of the way he was behaving (all of which was true). Whoever it was she was talking to through her earpiece eventually came back and confirmed we could go in but would have to wait around twenty minutes. We took it gladly, as it would otherwise be a full hour. In the event, we only had to wait about ten minutes before our name was called. Just inside the restaurant, Donald Duck was there for photos along with a Disney photographer and a handler (there’s always a handler whenever there’s a character in costume anywhere in the park). Everyone had their photos taken. Joey was instantly in a much better mood. 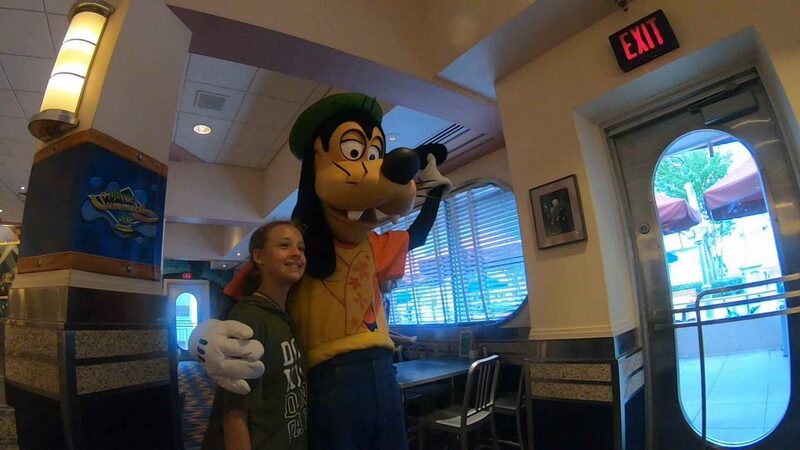 He loves meeting the characters. We really enjoyed the buffet, although I think the range and choice of foods wasn’t as good as it has been in the past. That said, it didn’t spoil our enjoyment. We even managed to get some special consideration for a couple of things we asked for that weren’t at the buffet. Joey, for example, wanted the meatballs but without the sauce. I mentioned this to one of the staff stocking the buffet food from the other side of the counter. She wasted no time in going behind the scenes to grab a plate full of sauce’less meatballs. With each of the character dining buffets we’ve been to, nothing has been too much of a problem and everything has been possible. Well-played Disney. Bonus points for what really has been a pleasant character dining experience all around. With tummies full again, we made our way over to the Star Tours attraction. This is the one thing that Joey really likes to do so we were happy to accommodate him. Naturally, we exited into the Star Wars giftshop, where he (and I, if I’m honest) was a kid in a candy store. I melted a little and agreed he could spend $30 on a new toy. Heaven knows how many extra bloody suitcases we’re going to need to shift all these toys and LEGO sets back to Europe. But that’s a problem for another day. 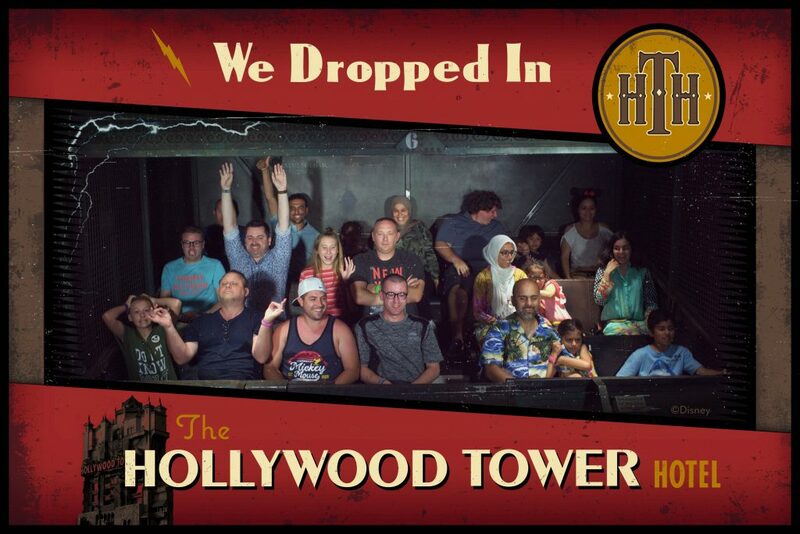 While Joey was wandering around the shop salivating over what he could spend his $30 on, Jennifer and I walked half the length of the park over to the Tower of Terror to get a DAS return time. The plan was we’d do that, come back to join Sandy and Joey and go into the Muppets attraction. It would then be time to head over to do our Tower of Terror ride before going in to Fantasmic. When we got to the tower, I thought I’d try a little social engineering. I posed my question about getting a DAS in such a way as to chance my arm at going straight in. I didn’t expect this to work but it actually did. She asked how many of us and I said just the two. She then waved us straight through to the fastpass lane. Bonus! Of course, this did mean that by the time we did the ride, checked our photos and were ejected back out into the street, there really wasn’t any time left to go back to do the Muppets and come back in time to get in to Fantasmic. I sent Sandy a message to clarify this. She was NOT amused. Oops! Once again, I was in the doghouse. I’ve been here so often now that the interior décor is really starting to look nice. The only silver lining was that it gave Sandy and Joey a chance to go through the Star Tours ride again. It turns out there are literally dozens of different variations of that simulation ride. Each time you go in, it’s a different experience. We had a fastpass slot for the Fantasmic show. 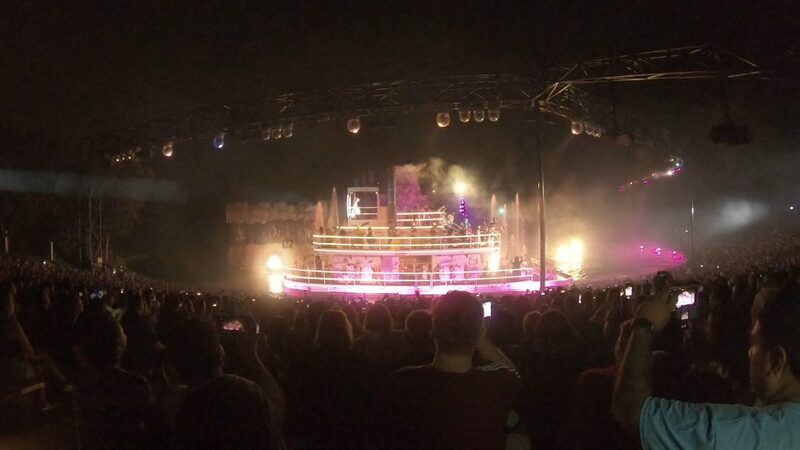 Even though the amphitheatre can seat around 6,900 with a further 3,000 standing, the show is pretty much packed out every night, so we were glad to have our fastpass access. I asked one of the cast members where we could sit that didn’t have speakers blaring directly at us and she very kindly took us to a particular disabled section. Cast members all over were directing people as they were streaming in. At one point, one of them noticed we were sitting in a disabled section with nobody else around us. I guess he must have assumed we’d just decided to take a spot of our own choosing, since he came up and asked us if we had been seated here by another cast member. Just as he was doing so, the lovely young lady that seated us pulled him to one side. I heard her tell him we were with her and that we had been given special consideration because we had an autistic child. That was enough to satisfy the man, who continued about his business chaperoning incoming guests into their rows. As dusk was setting in, so were the clouds. It wasn’t exactly raining but it looked like the skies were darkening and the storm clouds brewing. It looked to me like it could still go either way. We would either enjoy the show or the heavens would dump on us. When the heavens open up here in Florida, it’s like walking through a solid wall of water. 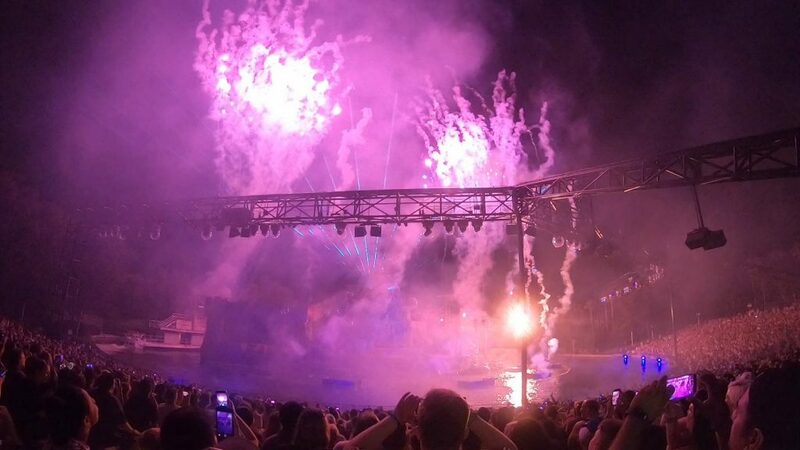 There were several announcements stating that the show was technical in nature and that it may be postponed or cancelled in the event of inclement weather. Even though it was a Monday on a day that all the US kids were back at school, the theatre filled to near capacity so far as I could tell. Fortunately, the weather gods were on our side this evening. The rain held off. By the time it was completely dark, the theatre lights dimmed, and the spectacular show commenced. I managed to shoot the entire thing on the GoPro, which was nice. We’ve seen the show a few times already but it’s still a brilliant piece of orchestrated theatrical story-telling. At the end of the show, about a billion people all stood up and made their way to the park exit. The show marked the closure of the park. We waited until the theatre was mostly empty before heading to the exit through the special walkway that’s not otherwise seen or used until the end of this show. Even though we waited, it was still standing room only all the way to the car park. We made sure to keep close tabs on both kids – and verified they each had their phones with them for in the event we got separated (this has actually come in handy on more than one occasion already on this trip). In the event, Joey and I did get separated from Sandy and Jennifer. They had followed the sheeple for a little longer than they needed to and ended up at the Disney bus terminal by mistake. It’s right next to the car park section where we happened to have the car, but that didn’t stop them from getting lost trying to find it. To be fair, their problem was they were looking for row 222, which is what the tram conductor told us when we first got off the tram at the entrance a few hours earlier. It turned out we were actually in row 214. Between our mobile phones, me putting the hazard warning lights on and beeping the horn a few times while on the phone with them, they did eventually find their way back and we all headed home. While I was waiting for the girls to make it to the car, I was playing with the car’s CarPlay system. It integrates with a smartphone that you connect. We’ve used it for playing music and connecting the phone to the car’s system, but we’ve so far been using the TomTom Go app for navigation. I thought I’d give the Google Maps app that integrates with the CarPlay system a try instead this time to see how that works. I was really quite pleasantly surprised. The spoken instructions are really very good. The map that tracks your progress as you navigate is quite clear on the car’s much bigger colour LCD screen. It worked so well, in fact, I’ve decided to continue to use it exclusively for navigation from now on. Safely back home again, we all settled in for the night. I offloaded all the cameras, phones, unpacked the bags, re-stocked the water bottles (we’re recycling them each day) and put fresh ones into the freezer, etc. Joey spent a bit of time with his new LEGO set before settling himself off to bed. Since I hadn’t completed yesterday’s blog, I polished that off and then wrote up the notes to this one. Currently, I’m a day in arrears with my blog posting. I’m OK with that, provided I don’t get too far behind.